EDITOR'S NOTE 11/21/2017: The new Climate Watch  platform is now available, allowing you to explore historical and projected emissions, countries' climate targets and their linkages with the Sustainable Development Goals. Our ability to harness ever-expanding amounts of data is completely transforming our understanding of environmental problems and solutions. Our Climate Insights blog series  leverages data from CAIT 2.0 , WRI’s climate data explorer, to shed light on the many dimensions of climate change that shape society, policy, and global development. All eyes are on Lima, Peru, where country representatives will gather next week for the annual U.N. climate negotiations (COP 20) . One question is at the heart of these negotiations: How can countries reduce emissions enough to collectively limit global temperature rise to 2 degrees C , thus preventing the worst impacts of climate change ? In Lima and over the next several months, countries are expected to put forward new national emissions-reduction pledges for achieving this target in the decades to come. WRI’s recently published the CAIT Equity Explorer  can help assess the equitability  of these pledges. While equity considerations  include more than just emissions—and all countries must take action to mitigate climate change—the actions of the world’s top emitters will likely be most heavily scrutinized—and rightly so: According to recent data, 10 countries produce around 70 percent of global GHG emissions. LUCF refers to emissions stemming from land use change and forestry. 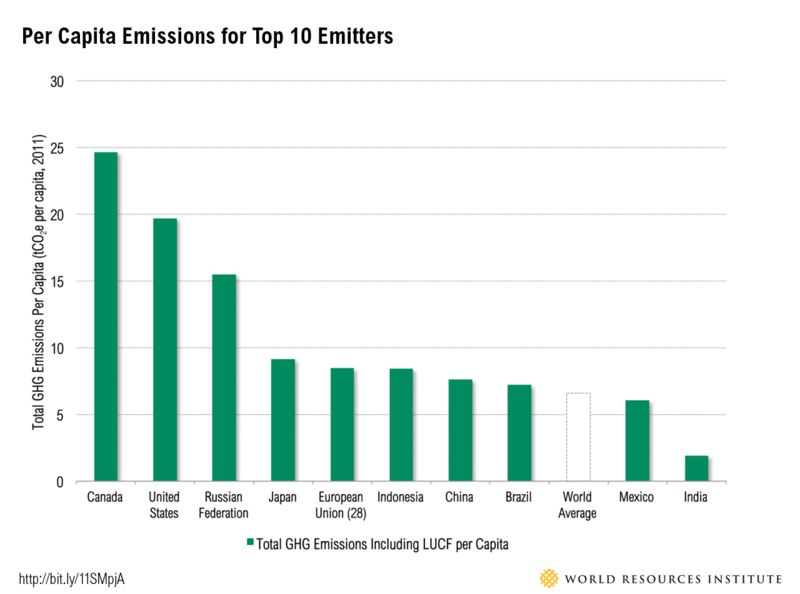 Here’s a deeper look at these top 10 emitters—examining their total emissions, per capita emissions, emissions intensity, and historical cumulative emissions—based on data from WRI’s Climate Analysis Indicators Tool (CAIT 2.0) . The previous chart defines the top 10 emitters based on their total annual emissions, also known as “absolute emissions.” Why? Over time, the absolute amount of GHGs emitted is what ultimately affects atmospheric concentrations of GHGs and the global carbon budget (see cumulative emissions, below). So the largest absolute emitters today have a larger role to play in determining the climate of the future. Regardless of other factors, these total annual numbers will have to be reduced for the top 10 emitters if global warming is to be limited to 2 degrees C.
Population and the size of the economy are two major drivers of absolute emissions. From the chart below, we can see that the largest absolute emitters comprised 60 percent of global population and 74 percent of global GDP in 2011. 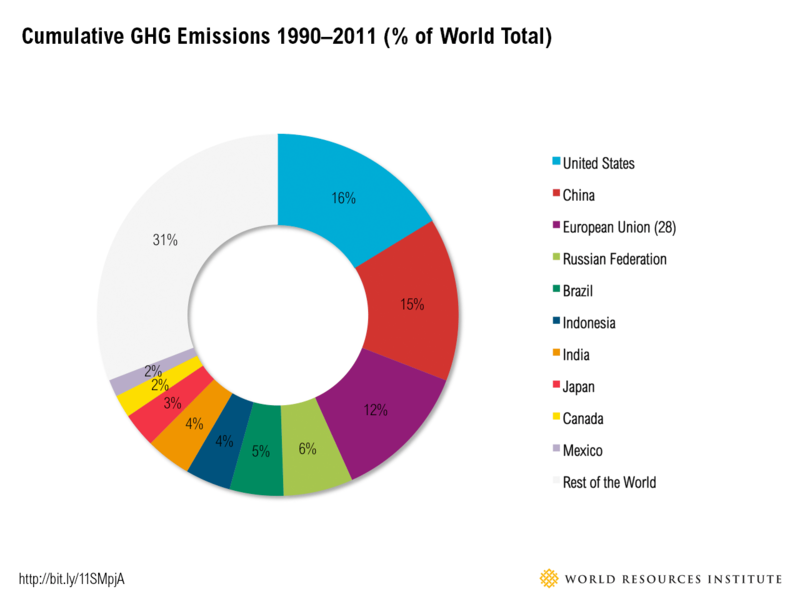 This also suggests that these countries have significant financial and human capacity to reduce GHG emissions. Emissions on a per capita basis bring contributions to climate change down to an individual level. Looking at this metric, the order of our top 10 emitters changes considerably. 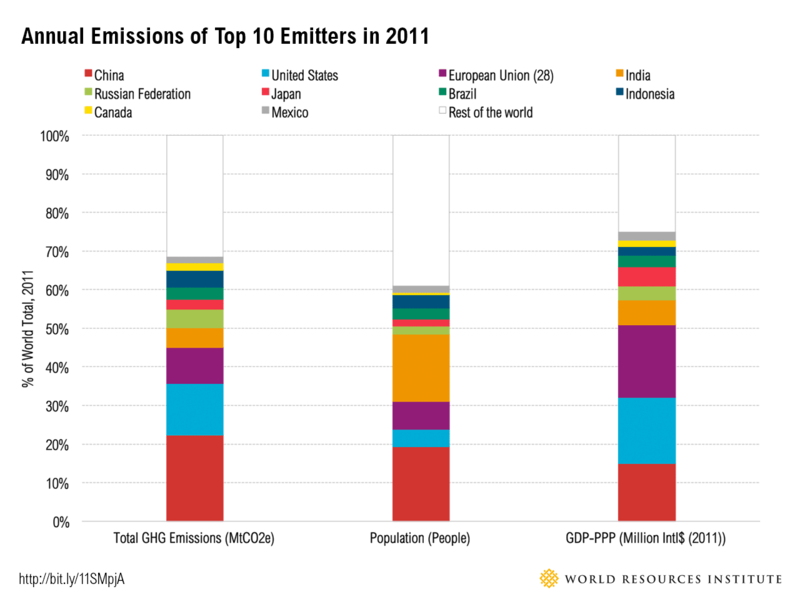 Among the top 10 absolute emitters, only two have per capita emissions that are below the world average. Canada, the United States, and Russia emit more than double the global average per person. On the other end of the spectrum, India’s per capita emissions are only one-third of the global average. 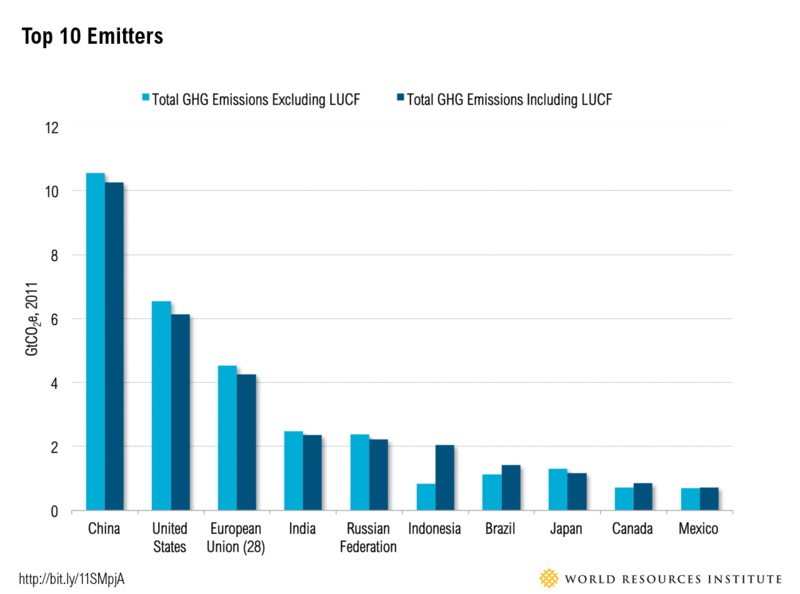 The level of GHG emissions per GDP is a commonly used metric of emissions intensity. It is useful when looking at the de-carbonization of the national economy or energy system. 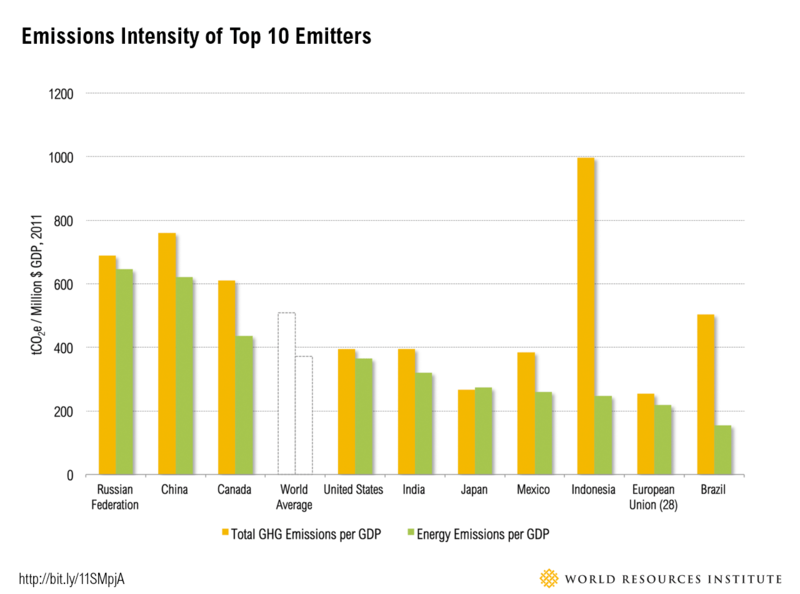 The graph above shows emissions intensity for the top 10 emitters’ whole economies and energy sectors. For the energy sector, the world average is 372 tonnes of greenhouse gas emissions (CO2e) per Million $GDP, but intensities vary across countries. Seven of the top 10 emitters actually have a below average emissions intensity; Russia, China and Canada are above the world average. These differences result from varying emissions levels and size of economy, but are also dependent on factors such as a country’s energy mix the carbon intensity of sectors like electricity and heat generation, manufacturing, and transportation. While many countries focus their de-carbonization plans on energy-related emissions, high emissions intensity could actually result from emissions from other sectors. For example, with emissions from deforestation and land-use change  taken into account, Indonesia becomes the most intensive emitter. 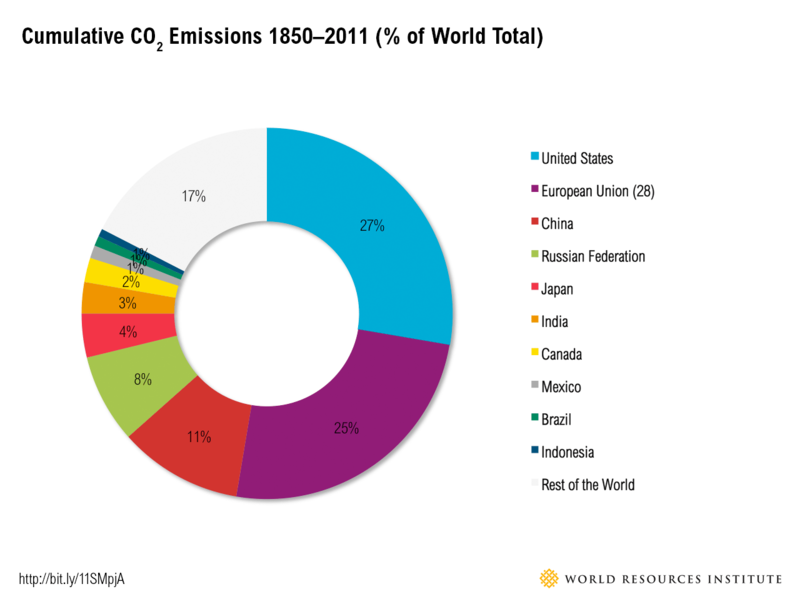 Cumulative emissions describe a country’s total historic emissions. They are a commonly used concept for understanding responsibility for climate change, since they are a proxy for the amount of current warming caused by specific countries. This measurement can vary significantly depending on the chosen start date and the inclusion of gases and sectors. The graph below shows cumulative emissions including Land-Use Change and Forestry (LUCF) for the top 10 emitters during the period 1990 to 2011, when complete data are available. Almost half of emissions come from just four countries: the United States, China, European Union and Russian Federation. The graph below expands the time period from 1850 to 2011, during which data only on CO2 emissions are continuously available. In this case, the five major emitters—the United States, European Union, China, Russian Federation, and Japan— together contributed two-thirds of the world’s historic CO2 emissions - using up around 37 percent of our global carbon budget . The picture of top emitters differs depending on how emissions are assessed. But regardless of how you analyze it, an international climate agreement cannot be successful without significant action from countries at the top of the emitters list. COP 20 is an opportunity for these countries and others to move forward with meaningful emissions-reduction plans that are both ambitious and equitable.